On November 25, 1783 the last of the British left Manhattan. Within the next few years things a sense of normalcy would return. From 1799 to 1802 butcher William Evert owned the property at No. 140 Bowery. Although it is possible that he constructed the two-and-a-half story house here; it was most likely Henry Lovell, who as listed as owner in 1808, or Ernest Keyser, who was here by 1818. The little frame house, like others in the area, reflected the Federal style. Two prim dormers pierced the peaked roof. Like Evert, both men were butchers. But it does not appear that they ran their shops from the house at this time. Keyser volunteered his spare time to Fire Engine Company No. 40. The ground floor had been converted to business by 1825, when Michael Armstrong ran his dry goods shop here. The space would change hands a few times over the next decade. In 1837 Jonas Levy, a jeweler, was here; and by 1840 Ransom & Wigins' hat and artificial flower shop was here. Sarah A. Ransom lived upstairs and she partnered with the daughter of another resident, Richard T. Wigins, in her enterprise. Wigins ran a drugstore at No. 756 Broadway. Also living in the house was Elizabeth Lloyd, the widow of Joseph Lloyd. Sarah Ransom had apparently moved on by 1843; but Catharine Wigins was still listed as “milliner” here. But the hat shop, too, would be gone by 1848 when Julius J. Newman lived upstairs and ran his clothing store in the building. The following year Moses May’s jewelry store replaced him. The shop would become home to Hyman Kaplan’s boot and shoe store by 1865 and he would do business here until 1868. That was the year that John Callahan moved in. 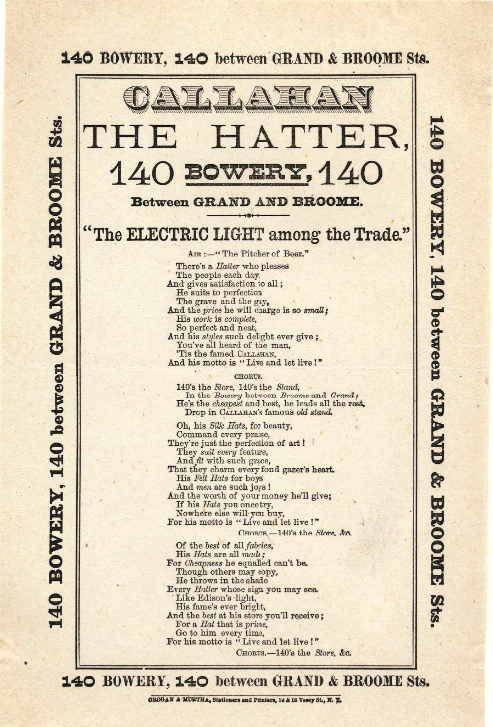 He had arrived in New York from Ireland prior to 1860, bringing with him a thorough knowledge of hat making and a brilliant marketing sense. He married Anne McKeon and, in 1860, established a hat making and retail shop. Now in 1868 he moved the operation into No. 140 Bowery. 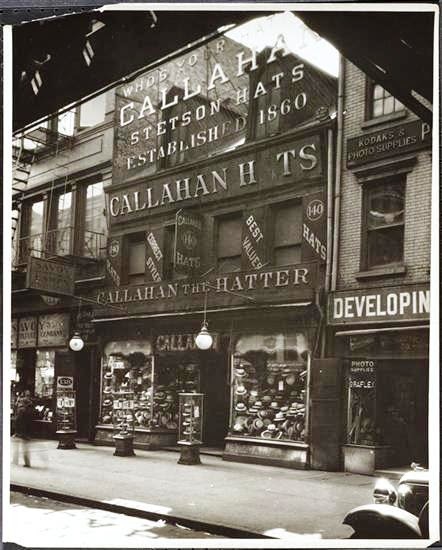 The shop that had seen rapid-fire turnover in proprietors was now home to Callahan the Hatter—and it would remain so for more than 60 years. Callahan aggressively marketed his top-quality hats with clever advertising. 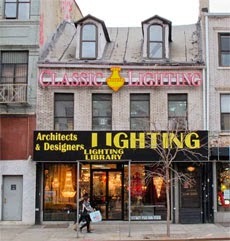 His phenomenal success allowed him to purchase the building. While he grew his business, upstairs the Crager family was living. Adolph and Julius ran their clothing store at No. 24 Bowery and would live here at least until 1876. The Cragers may have been forced out by Callahan’s interior renovations. In 1878 he hired architect Fred H. Coles to do alterations. The cost to Callahan was $2,000—nearly $50,000 today. It was most likely at this time that the Callahan store expanded upward into the residential space. Three years later Fred H. Coles was back, filing plans now to “take out three windows, put in five and raise roof three feet.” The ambitious plans were scaled back however, and the quaint dormers and peaked attic roof remained. Two boys, James Johnson and Mathew McMahon, were caught by police after burglarizing Callahan’s store in 1881. They pleaded guilty on September 15. Despite their youth, Judge Cowing sentenced Johnson to three years and six months, and McMahon to three years in the State prison. Callahan’s aggressive advertising campaign included around 700 signs around the city in 1889. They cost him $21,000 and an associate would later say “That seems like considerable money, but it certainly paid.” He established himself as the official hatter of the St. Patrick’s Day parade—the expense of which, as Macy’s department store would learn later with its sponsorship of the Thanksgiving Day Parade, was far outweighed by the marketing exposure. 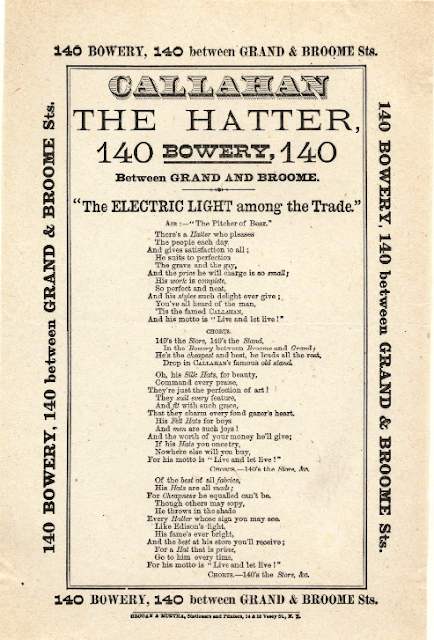 No longer a favorite for “the devil’s work;” the Bowery had been discovered and low, vintage structures were rapidly falling in favor of sleek hotels and commercial buildings. In 2011 the two-century-old dormers were discarded and the gaping wounds covered with a hideous black material. But the loss of the dormers would no longer matter by spring of 2015. The three buildings at Nos. 136 through 140 Bowery were sold for $45 million in the fall of 2014. The Montana-based firm of Max A. Hansen and Associates filed demolition permits in May 2015, sounding the death knell of the 200-year old Callahan the Hatter structure. Some simply don't see, but how incredibly stupid. I still think on post-WWII Europe and how much was destroyed there, only to be rebuilt, at least in part. Some buildings and blocks were painstakingly reconstructed from photographs and plans - often using original bricks and mortar. Here, we use any destruction as a pretext to erasing everything or demeaning what we still possess. I look upon some developers as evil chickens - staring blankly at the piles of feed they must demolish for their immediate gratification. Yet these chickens even plan on future piles, making them scary incarnate. It sounded like you said the faux-brick cladding is covering a WOOD facade? If so that would make this the only wood frame with wood face building on the Bowery and one of only 2 or 3 in lower Manhattan. The building north, which had an extra story added in the 19th century was built at the same time and they would have made an 8 bay run of windows. Wow, there is not a single 8 bay wood facade in all of NYC and that fake brick had very likely preserved the original clap board siding if its in fact under there. What a remarkable thing it would be to restore these special survivors to their early 19th century state.